Welcome to Shepherd's Purse Alpacas! We are Cindy and Wayne Aldrich -- AKA, SHEPHERD'S PURSE ALPACAS. 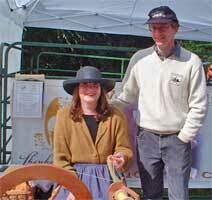 We celebrate our seventeenth anniversary this year, having purchased our first alpacas in 2002. We "bought the farm" in Mount Airy, Maryland in the summer of 2002, and finally brought our four girls and little boy home in April 2003. Our herd is now up to thirty -- nine boys and twenty-one girls. We are really enjoying the Alpaca Lifestyle! We are very excited to be realizing our dream to own and breed these beautiful animals. 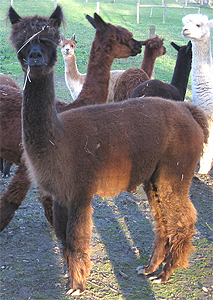 We are especially attracted to the fine fleece that alpacas produce - we believe it's finer than cashmere! Our aim is to breed an excellent quality animal, both in conformation and temperament, and to aggressively market the fleece and finished end products. Our It's Alpaca Boutique offers fine alpaca gifts and is open the second Saturday of every month, and by appointment. The boutique and farm will be open Saturday, April 13th, from 10:00am to 5:00pm. Come by to visit the alpacas for your last time to see them in full fleece before shearing! Click What's New for more visiting and shopping information, and all the farm news, including which boys and girls won ribbons at the 2017 AOA National show! For more information contact Cindy and Wayne by email or at 301-829-4798. Visit us at the farm: 7971 Bennett Branch Road, Mount Airy, MD 21771. To arrange a farm visit or a shopping appointment, call Wayne at 301-452-1874. Watch for frequent updates to this site!